My oldest Dear Daughter (DD) has a female friend at work (FF@W). This FF@W had decided to declutter, purge and otherwise uncomplicate her life & house. I suppose DD has talked to FF@W about the quilting/sewing I do because this past January DD called me up to say that FF@W had some scraps to get rid of and was I interested? Part of the booty was a partially sewn quilt top. 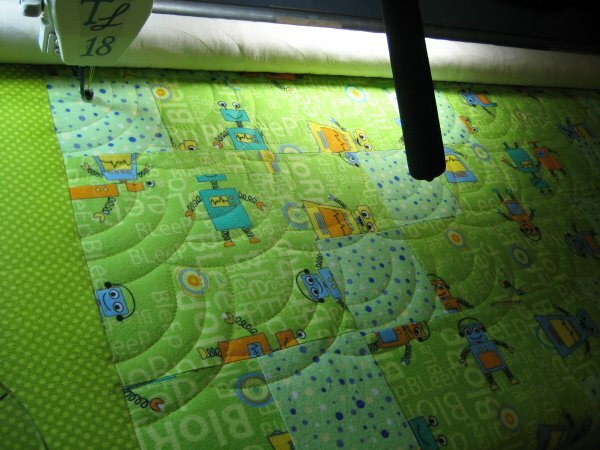 FF@W had sewn 4-patch blocks in a delightful in-your-face green robot print. There was also some coordinating flannel yardage. I had no idea what FF@W had intended on doing with the 4-patches but *I* simply cut out plain blocks from the coordinating yardage. I then alternated the 4-patches with the plain blocks, threw on a slab-o-border from a different but coordinating flannel that I specifically purchased for this quilt. It went together so quickly I wondered why I don't do more simple quilts like this one! I asked DD about the sewn blocks (why would you go to the expense of buying the fabric, cutting & sewing the blocks only to get rid of it??) and she said that FF@W was known for getting interested in a hobby, going gung-ho for a while then abandoning it mid-stream. That completely explained the sewn blocks. The kicker is that FF@W is now pregnant. 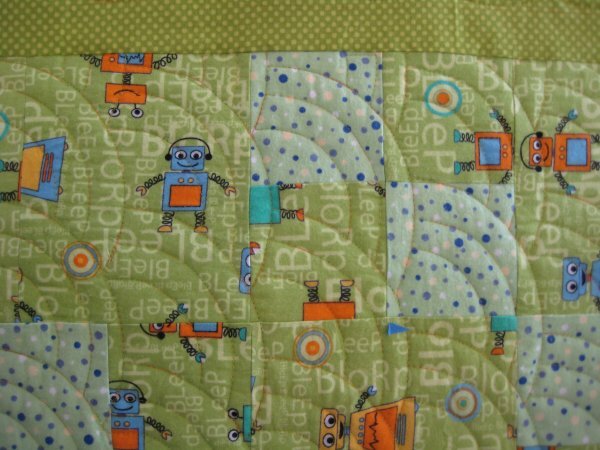 I asked DD if she thought FF@W would like the flannel robot 'returned' to her as a quilt for her new baby. DD said that was a delightful idea; so the top got loaded onto Lizzie (my Tin Lizzie 18 longarm machine). [Further update: during the course of a conversation with DD, we decided that it would better if FF@W would be given the quilt NOW, as opposed to later. That way, *she* has the quilt in the event that she or DD change jobs, move away or whatever. Then, it's her responsibility to keep track of it. :-) And so, it was done. DD gave FF@W the baby quilt and DD said the reaction was awesome. 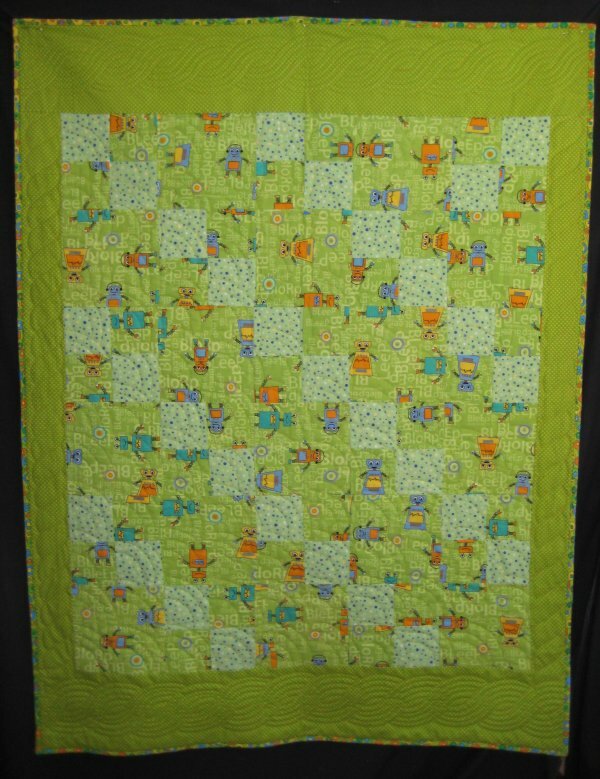 FF@W said that there was no way she could have ever produced such a wonderful quilt. She even snailmailed me a thank-you card, proving that her Mama raised her right. :-) I'm glad that FF@W has the quilt because, as it turned out, it wasn't too long after that, that DD got a transfer to Seattle, where she and her husband had just purchased a house. Good timing on our part. :-) ]. Preliminary ideas were to do a rope/cable design in the slab-o-borders and Baptist Fan over the interior blocks. Since the top & bottom borders are wider than the side borders, I need to think of something to do in the corner spots to either nicely connect the rope/cable designs or quilt a completely different motif in the rectangular cornerstone spots. Or something. Because I like to advance the quilt as few times as possible, many times I will load the quilt crosswise so that the longer length (i.e. 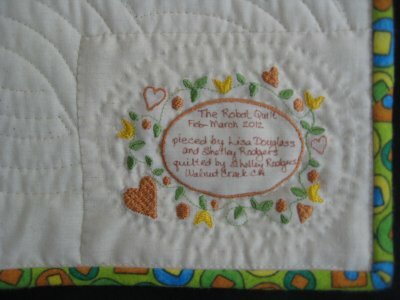 the side of the quilt) is pinned to the leaders. In this particular quilt, the side borders are narrower than the top & bottom borders. I decided I would use a single rope design in these areas. For the single rope design, I use DeLoa Jone's "Rope-a-Dope". This one is the 3" high template. It's VERY easy to use and you get exceptional results. The 62" length was quickly done. Gosh, it looked so pretty! 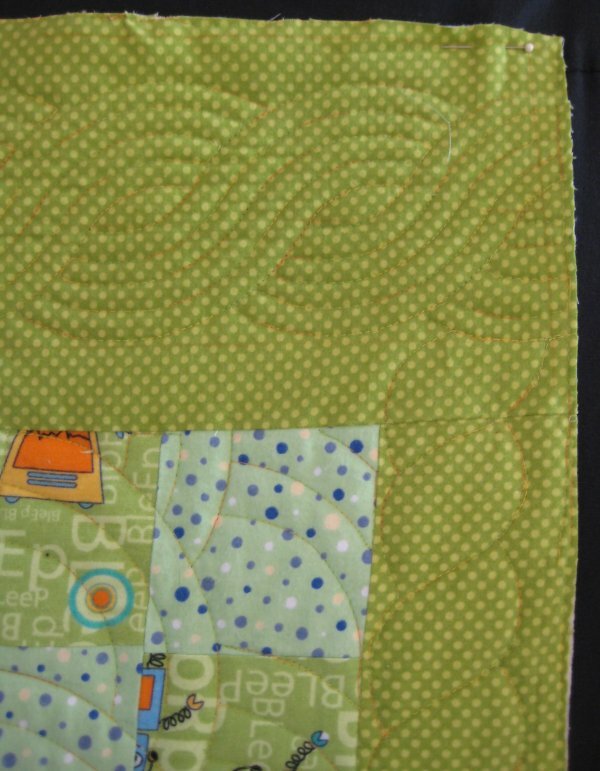 I decided to defer a decision on the corner designs until I did the 5-line cable in the top & bottom borders. Next were the Baptist Fans in the interior. I don't have any fancy templates to create it ... I use a bunch of concentric circles that I continually swap out for the size I need. This particular quilt used my 4", 6" and 8" circles. (I have them from 2" on up to 12". They come in handy for all sorts of applications). I finished the first pass of the Baptist Fans and stood back to admire my work. Gosh, it looked so pretty! And then I remembered .. oh yeah, I didn't check the tension before I started. Ooops. Lizzie keeps wonderful tension, so imagine my complete and utter HORROR when I ran my hand across the backing and discovered ..... flatline stitching. Oh. My. Gosh. The tension was *so bad* that the bobbin thread was simply laying on the backing whilst the top thread was poking up in little loops. Then I remembered .. oh yeah. The last quilt was one with Superior's So Fine on top and for this quilt, I was using Superior's King Tut. King Tut is a MUCH thicker thread and requires different tension than So Fine. Duh. Whatta doofus. Well, rats. Double rats. Dang, *dang*, DANG. ::picture me with a digusted look on my face and stomping around in my studio:: I know there is nothing to be done but rip out the single rope and the Baptist Fan stitching. ALL of it. Man, was I really, really annoyed. I don't think I'll forget about checking the tension *first* for a very long time. Fortunately, because the bobbin thread was just laying there, being lazy, all I had to do was pull on the bobbin thread and it slid right through all the little loops. The King Tut thread on top came off in one humungous thread. After properly setting the tension, I re-stitched the single rope and began again on the Baptist Fans. I ended up with 11 rows of Baptist Fans before I reached the other side border, where I repeated the single rope design. 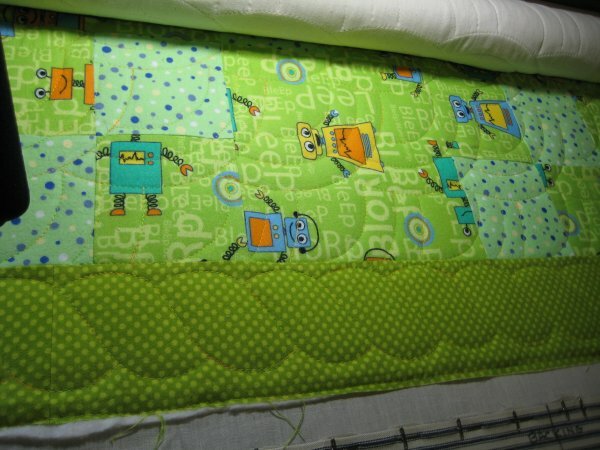 Then, I removed the quilt, turned it and reloaded it so the top & bottom borders were pinned to the leaders. I didn't want to use the single rope design for the top & bottom borders because those borders were so much wider. Instead, I opted to stitch a 5-line cable. 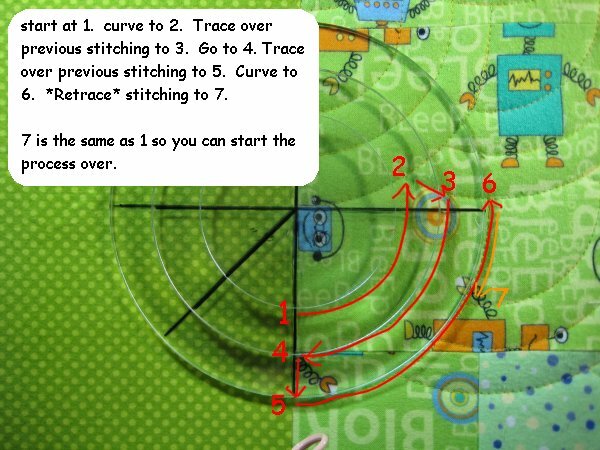 For this design, I use the Cable Tool template by Nancy Johnson from Quilter's Rule. This creates a *fabulous* 5-line cable design. However, the template *is* complex and has 4 removeable pieces. Fortunately, the instructions are printed right on the template, so you'll always have them available. If you ever lose one of the pieces, you're gonna be outta luck. The cable in the top border was stitched without a hitch. As for the corner treatment .. I wimped out. :-) The cornerstone area is a long, skinny rectangle. I knew that I couldn't make a corner design that would transition gracefully from the single rope to/from the 5-line cable design. Soooooooo .. I just butted them together. Nah, it's not too elegant but my brain was too tired to put into Creative Gear. 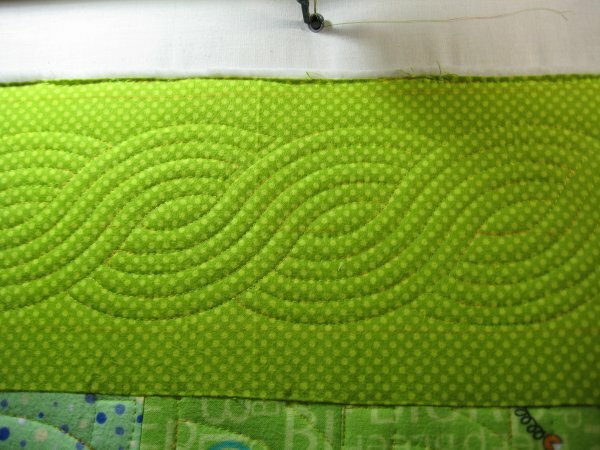 I proceeded to happily stitching the cable in the last border. The end was in sight. I was anticipating the delicious feeling of completing the quilting when DRAMA struck. 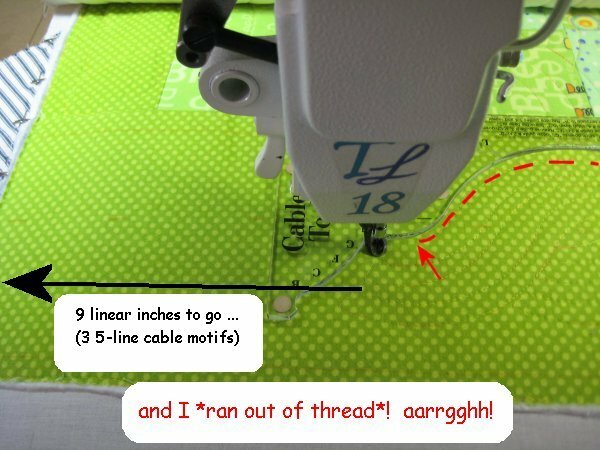 At 9 inches from the edge of the quilt (which translates to about 3 cable motifs), I ... ran out of thread. I don't have another spool of that thread. I could make the mad dash to my local quilting store in the hopes they had it in stock but .. but .. I don't WANNA take the time to do that. So, the quilting is now finished .. the corners have been squared. [Update: ta da! the label is done! I've given piecing credit to the FF@W and myself and quilting credit to myself.